I think I was 14-years-old at the time. I was walking briskly (I don’t want to admit to skipping) from our home in Lotopa to the sports fields on the Pesega campus when a bus pulled over in front of the old Tanoa Club. I didn’t pay any attention to it though because I was working out in my mind how I was going to unveil my latest low-post basketball move to my friends Si’u, Peter, Anthony and the rest of the Pesega basketball court die hards. I should have paid more attention. By the time I snapped out of my reverie two drunks who had apparently hopped off the bus were right in my face. 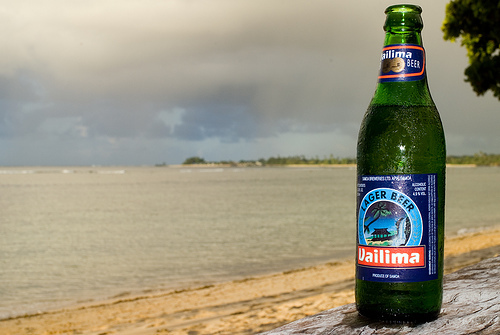 “Where you going?” one asked in Samoan, his breath stinging my eyes with alcohol and spittle. “Go get me some money!” the other yelled in a drunken drawl, grabbing the front of my shirt. I tried to break free from the latter’s hold but his mangled knuckles had a fist full of my HangTen tee shirt and was demanding that I go back to my house and get some cash. “I don’t have any cash,” I finally managed to eke out through my constricted lungs in exasperated breaths, still trying to get away from the two filthy drunks while trying desperately to maintain my composure and deny them any gratification at sensing my fear. Suddenly the first drunk punched me square in the jaw. Momentarily dazed I nearly went down but was oddly grateful for the second drunk who held me up by my shirt. He seemed stunned for a moment as well before launching his own attack on my face. As quickly as it happened, it was over. I stumbled back to my house, tears stinging my eyes but my mind refusing to let them fall or I would definitely lose it. Warm blood trickled from one corner of my mouth and my eye felt like an anvil had fallen on it. My jaw felt a bit off kilter too. As I turned into the gate that led into our home a few of our neighbors saw my staggered steps and ran towards me. “What happened?” I heard one of them ask. I never saw those men again but that day has left a lasting impression on my mind about a problem that I believe has been an epidemic in Samoa. I read two stories just this week in the Samoa Observer that reminded me of that day and the fury I’ve felt ever since being targeted by drunks. Since that day I’ve had a healthy grudge with people who cannot hold their liquor. Yes, the problem is not isolated to Samoa but I speak of my island home because of my Samoan experiences there as a youth. In my mind, there is nothing that incites men and women to do more horrific things than does alcohol and in the current climate – drugs. In one story, a young man from the village of Luatuanu’u, Jason Tioa, was nearly stoned to death by two drunks. There was no motive for the attack and it appears that Tioa just happened to be in the wrong place at the wrong time. Sadly, when it comes to drunks, any time and any place seem to be wrong. The part that is most exasperating about this case is that the two drunks are known to Tioa, they were reported to the authorities and yet, nothing has been done. If I’ve read it correctly, they haven’t even been taken into custody! In the second story, visitors from Australia were enjoying an evening meal when a drunk interrupted them and challenged them and everyone in the restaurant to a fight. Well, a fight eventually ensued and at least one man was taken to the hospital with a serious injury. I profess my enduring love and ceaseless devotion to Samoa and my people but my experience and the experiences suffered by the people in those two stories are an indication that this is an ongoing and rampant problem in Samoa. Those under the influence causing grievous harm to others and endangering the lives of innocent people must stop or at the very least the guilty parties need to be dealt with more harshly. What is being done to ensure the public safety? What are the thoughts of the Samoa Visitors Bureau and the Honorable Minister of Travel and Tourism about the issue and what is being done within their circle of influence to curtail the violence inflicted upon visitors from overseas? What is the Health Minister doing to inform the public about the affects of alcohol from both a mental health and a physical health perspective? Has any data been collected showing the adverse affects that these incidents have on local businesses and the overall well-being of Samoa’s citizens? Regrettably these stories of abuse were reported because the crimes were committed against parties outside the offenders’ families or at least as far as we know from the reports. But what ghastly crimes are being committed against victims within the offender’s own family? I know that there are wonderful organizations that have been working tirelessly to end abuse of any kind within Samoa but this predicament will remain an issue for Samoa until more victims speak out, the authorities take a more earnest and visible stance against the offenders and harsher penalties are put in place to help mitigate this ongoing pattern of abuse. Stop using alcohol as an excuse to inflict harm and impose your will on the innocent. Alcohol is the coward’s way of saying, “I need a crutch to beat you senseless because I don’t have the courage to do it with my mind.” To my beloved Samoa and it’s leaders, please put an end to these random acts of violence fueled by alcohol by throwing the book at the offenders. Previous Previous post: Got Haka? I just recently heard of the incident at Pinatis where a drunkard harassed some patrons. We were just there in Samoa in August and had ended up at Pinatis’ one night, and guess what? We were approached by a drunk guy too who was trying to get some play noticing that our table held only females. We ignored him and kept eating and eventually he got tired of watching us eat so he moved on. I guess we were lucky! About 2 months ago I also read of another incident where a man was on his way back from Fono Tatalo (prayer meeting) in the early morning, and was accosted by a couple of drunks who beat him to death when told to keep the noise down. Truly sad. It happens everywhere, but when you hear it being done in Samoa it’s almost like it happened to a close relative. It is truly sad because there seems to be so many of these incidents these days in Samoa. It is definitely not the idyllic home I remember from my youth.